On the eve of Independence Day, children were quite excited as they were going to be part of double celebration the next day. Early morning, they were to attend school for flag hoisting followed by a small cultural program. Later, around 10:00 am Door Step School (DSS) team had also organised short fun filling program for parents and children in various construction sites. Photo: Najma addressing one-and-all present there. Parents were involved along with the children. 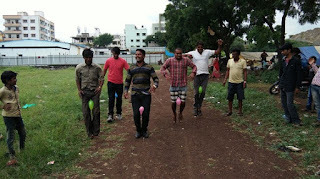 Recreational games like musical chair, passing the ball, balancing a book on head, lemon and spoon, etc were being played at different sites. 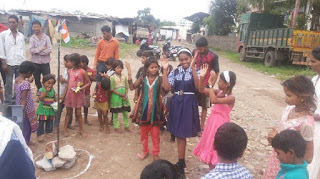 Entire team of Door-Step School, would like to express their gratitude towards all those volunteers present at various sites and contributed in every way possible. 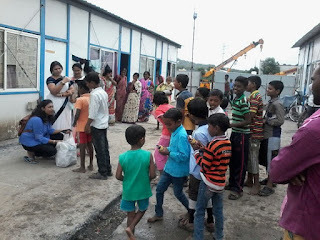 Photo: A volunteer seen distributing packets of biscuits among all the children present. With the aim to spread awareness among migratory labours that schooling of their children is possible, DSS team could get active parents involvement in their children’s education this past one year. Without missing out on the opportunity to acknowledge parents and their efforts, Team DSS tried celebrating the day with a meaning. Few Facts and Numbers: Under Every Child Counts campaign, 13 Centres were covered involving minimum of 600 parents and close to 715 children in total. 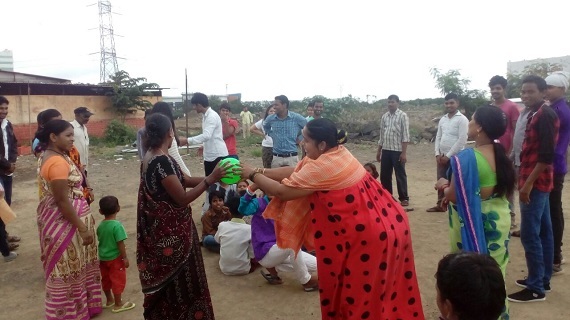 Under Project Foundation, 45 centres were covered. We await the next Independence Day with a guaranteed excitement and joy to be shared with you all!